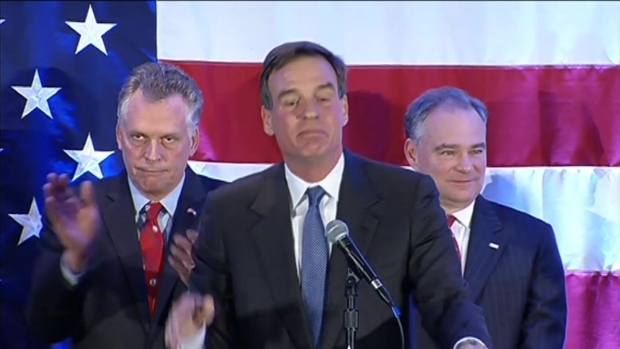 NBC News is calling incumbent Mark Warner the "apparent winner" in Virginia's Senate race, as officials work to certify election results in the razor-close race. Throughout the day Wednesday, Warner hung onto a slim lead over Republican challenger Ed Gillespie. NBC News' designation of Warner as the apparent winner means the media organization has tallied enough votes to indicate that he has won the race. However, the results may well depend upon final official tallies or a potential recount. By late Wednesday afternoon, Warner continued to lead Gillespie by slightly more than 16,000 votes, with more than 99 percent of precincts reporting, according to unofficial results from the Virginia Department of Elections. However, his advantage eroded by 801 votes since earlier in the day, reported News4 Northern Virginia Bureau Chief Julie Carey. Canvasses, during which election officials certify results, began statewide Wednesday morning. Throughout Tuesday night, a guard stood outside a room at the Fairfax County Government Center, where the county's unofficial voting results were stored. The door was sealed with stickers bearing the signatures of the electoral board, reported News4's Megan McGrath. Officials filed in around 9 a.m. Wednesday and election workers began the process of double-checking printed out tapes of the results against the numbers reported election eve. By day's end, about half of the precincts had been canvassed. 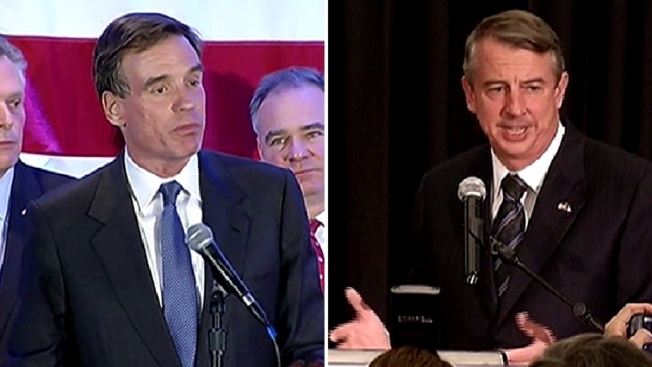 Errors and transcription mistakes resulted in a loss of 300 votes for Mark Warner and of 800 votes for Ed Gillespie. "Teams of two, one Republican and one Democrat, with observers, are going to be going through each of the precincts, verifying all the math is done properly, everything is in place, all the forms are filled out properly, [and] all the tabulations have been done accurately," said Brian Schoeneman, Fairfax County electoral board secretary. "Based on the numbers I've seen, I've not seen anything that would make a dramatic change. One precinct looked like a 900 vote shift, 300 in another but nothing like thousands of vote totals that would have an impact on Sen. Warner's current lead." The electoral board is also reviewing provisional ballots. In Fairfax County, voters who had trouble with photo ID and cast provisional ballots have until noon Friday to bring in their ID -- so officials won't have a final tally until then. A similar process is taking place across the Commonwealth. Marc Elias, Warner's lead election attorney, said Wednesday that he believes the canvass and count of provisional ballots will only add to Warner's total. He said that historically in Virginia, Democratic candidates have tended to gain through the process. Elias said he knows of no precedent for a lead of this size to change through a canvass. They have lawyers across the commonwealth to monitor the process. "Now we owe it to the voters of Virginia to respect the canvassing process that is underway to get an official result," Gillespie said in a statement Wednesday afternoon. "We will be watching the results closely so that we can ensure Virginians have confidence in the accuracy of the results.... I will respect the decision reached by Virginia's voters." It remains to be seen whether there will be a recount. The State Board of Elections will meet Nov. 25 to certify the canvassed results. No recount can be request until after that. Virginia does not have automatic recounts. According to commonwealth law, a candidate may request one if the margin is less than 1 percent of the total vote. If the margin is less than 0.5 percent, the government will finance the recount. Gillespie trailed Warner by 0.73 percent Wednesday afternoon, according to unofficial results from the Virginia Department of Elections. In a speech to his supporters Tuesday night, Warner thanked Virginians and congratulated his challenger on a hard-fought campaign. "I wish [Gillespie] well ... I know he'll stay stay involved in Virginia and national politics," Warner said. "I promise I come out of tonight's election energized, fired up and ready to go to get our country on track." Warner seemed confident in a victory, although he admitted it would be by a small margin. He said that voters want an end to partisan politics, and that the parties need to work together. But Gillespie has not conceded, saying there's more work to be done. He told his supporters to be patient and told them he would have a better idea of the outcome Wednesday. "Unfortunately some campaigns last longer than others, and I'm going to need a little more hard work ... we know there will be a canvass that commences [Wednesday] and we will have a better sense [of who won]," Gillespie said. "We're going to be patient here." 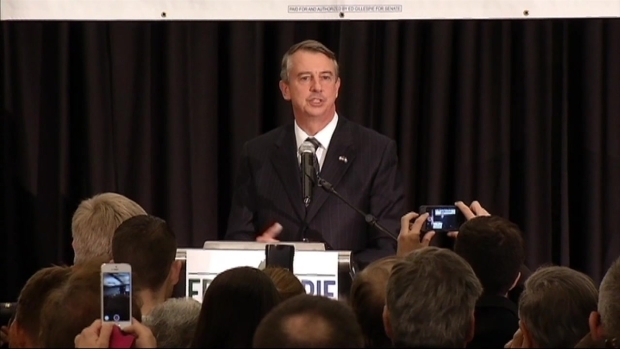 The 2014 Senate run is Gillespie's first attempt at seeking public office. He has previously worked behind the scenes for former Virginia Gov. Bob McDonnell, for former presidential hopeful Mitt Romney and as chairman of the Republican National Committee. Warner's name has a long legacy in Virginia. He was elected to the Senate in 2008, and previously as governor. But this race was contentious. In the weeks prior to the election, both men threw daggers in TV ads, describing each other as "Washington insiders;" Gillespie attacked Warner over his voting record and siding with the president, while Warner attacked Gillespie's past as a GOP operative and lobbyist, specifically for Enron. Warner has led Gillespie in opinion polls throughout the race, but Gillespie has said he was optimistic about his chances of pulling off a historic upset. Warner ran on his reputation as a bipartisan and his career in Virginia politics. Gillespie, meanwhile, has been among the few Republicans nationwide to offer a comprehensive alternative to the Affordable Care Act. Gillespie's plan would no longer obligate people to obtain health insurance, but would provide tax credits to help buy it. The proposal received modest attention in the contest.